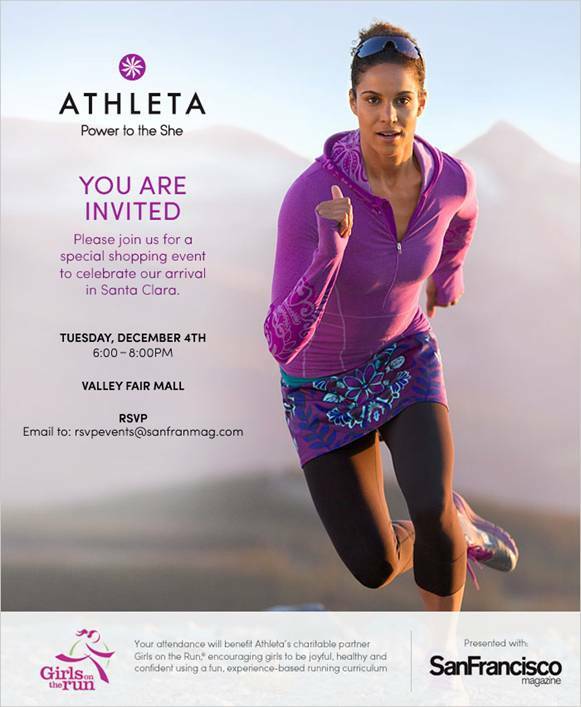 Athleta is opening a store in Valley Fair - whew, just in time for Christmas. The store is located near Sephora, on the first floor of the massive shopping center. According to the company, the store will feature a broad assortment of apparel for run, yoga, gym/training, swim, hike/explore and everything in between. The Valley Fair store will offer a personalized styling service, uniquely tailored to individual athletic pursuits and style with Performance Stylists, complimentary hemming, kiosks that link directly to the website offering customers access to additional product and sizes, free fitness classes and in-store discounts for fitness professionals. Telling people to exercise isn't working. So why does the fitness community just do it louder and more often? According to a terrific article in today's New York Times by Tara Parker-Pope, "Only 3.5 percent of Americans between the ages of 18 and 59 do the minimum amount of physical activity recommended by the Department of Health and Human Services: 150 minutes a week of moderate activity." She also says that when it comes to self-reporting, about 40 percent of Americans say they never exercise, a stat that has remained steady for decades. I found Pope's entire article, "Updating the message to Get Americans Moving," a great read, and would encourage you to check it out. My first takeaway from reading it is that over the past 10 years, there seem to be 100 times more blogs and magazines and fitness gurus and tv shows that all talk about how easy it is to exercise. And yet, it changes nothing. The same percentage of people are still inactive. So the gurus, tv doctors, gyms, fitness instructors say it louder, in even more brain-numbing terms, and in more places. The other thing it brought home to me is how stratified our country has become in terms of health and fitness. I'd venture to guess that among my friends, fewer than 20% would report they never exercise. Some of that probably reflects that I live in Silicon Valley with a high percentage of active adults. More likely it also reflects that people who are active hang out with others who are active. I'm a slug compared to most of my friends who are busy running marathons, biking for fun, and hiking for weekend pleasure. I'm more about yoga and stairs and my PowerPlate machine. In any case, it's not about how or what, and I digress. Read her article. I like that she actually says out loud what fitness people seem to ignore: telling people to work out, telling them exercise is good for them, giving them easy tips is "clearly not working." Heart attack or holiday indigestion? Two apps and a short code to keep on hand. Here's a note that came over the wires from ERtexting.com. The info seems appropriate as we head into Thanksgiving and the holiday season. iTriage Health: Created by two ER docs, iTriage helps you answer the questions: “What medical condition could I have?” and “Where should I go for treatment?” Great for helping determine whether chest pain is a heart attack or post-turkey indigestion. CPR + Choking: Developed by University of Washington educators and doctors, this app offers instant videos on how to perform CPR and aid a choking victim. ER Texting provides texting services to hospitals and urgent care facilities that want to post emergency room wait times and allow consumers to access those times via text message. The firm's clients include: Miami Children’s Hospital, Adventist Health System, Cincinnati Children’s Hospital, Metrowest Medical Center, Lawrence General Hospital, Park Ridge Health, The Hospital of Central Connecticut and Shawnee Mission Medical Center. It's one thing to lose weight and get fit, and another to stay there and continue to improve. The following announcement crossed my email today, and I have to say, "Way to go" to Ali Vincent, the winner of "The Biggest Loser" season five and the competition's first female winner. Now, five years later, she's making good on the promise she made to herself and fans across America. At the time, Vincent said she would either be married with kids or have completed her first IRONMAN. On November 25, Ali is making good on her promise and competing in her first IRONMAN competition at the Ford IRONMAN in Cozumel, Mexico. The race consists of a 2.4-mile swim, 112-mile bicycle ride and a marathon 26.2-mile run. Since winning the weight-loss competition show, Ali has dedicated her life to spreading the message of health and fitness and, as part of that, hosts LIVE BIG WITH ALI VINCENT (the Live Well Network). Vincent started training at the beginning of 2012 using an online program, but discovered her busy life needed a more tailored approach. Since June she has been working with Coach Sonja Wieck. Her experience will be shown an episode of LIVE BIG WITH ALI VINCENT that will air in early 2013 on the Live Well Network. “While I’m anxious to tackle the biggest physical challenge of my life, I’m excited to share the experience with my Live Big fans,” said Ali. Two fitness products for people and their dogs have come my way that are worth a mention - Dog-E-Glow and Thank Dog! Bootcamp (a mobile app). I'll likely be including them in holiday articles on San Jose Fitness Examiner, but space constraints and format there make it easier for me to tell the longer story here. Thank Dog! Mobile is an app developed by Metova, Inc. for iPhone/iPod touch. This health and fitness app goes for $.99 and allows users to enjoy a challenging program of cardio and strength training, plus dog obedience training, all at the same time. It is created by the people who run the Thank Dog! Bootcamp facility in LA, which incorporates nine dog commands. The mobile app includes only the four most basic: heel, sit, down and stay. The cardiovascular parts of the program benefit both dogs and their owners, making both physically tired and mentally stimulated. Included are a variety of heart rate boosting activities, such as jogs, sprints, high knees, wide steps, and more. At every step, users are encouraged to go at their own pace, substituting activities of lesser or greater difficulty whenever appropriate. 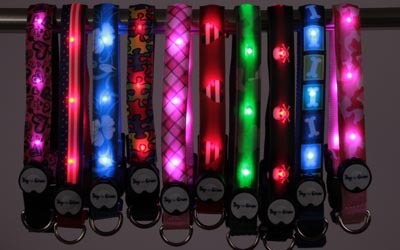 Dog-E-Glow is a line of LED-lit collars and leashes that are cute and practical. The company sent me one of each to test, and I took the leash to a party where pets were included. After dark, I put the leash on on of the dogs and took her for a walk. Everyone was oohing and ahhhing and talking about how much they disliked walking their dogs in the winter because it's so dark, and difficult to be seen. The LED lights on Dog-E-Glow remain steady, or blink on and off. Priced under $30 each, I could have sold a half a dozen right there at the party. I figured I knew what I was buying all my dog friends for the holidays. Then the bad news. While the leash worked as promoted, the collar wouldn't work with the batteries included, even with the backup batteries included. It was a new collar in the sealed package, so it's not that I got some demo model. I was apparently sent a collar that would have gone to a customer. In any case, a new set of batteries got me set up but after two days of testing, the built-in off/on button stopped working. The lights would go on, but to turn them off, I had to unscrew the battery case and remove the batteries. After doing that once or twice, I had pretty much ruined the small screw that held the battery case closed. We all know things like this happen, and the company has online customer support which I did not use. Instead, I emailed the contact who sent me the samples and in addition to an apology, and the assurance this rarely happens, was told that any time the product doesn't perform the policy is to replace it. I'd still give it as a gift, but now consider it more a novelty than a product built to last. An article published in the Journal of the International Society of Sports Nutrition presents interesting information about a study conducted by Athletes’ Performance in Phoenix, Arizona. The upshot is that there are significant benefits to drinking cold water during an intense workout compared to room-temperature water. One example of superior workout results in the study: nearly 50% of participants who drank cold water improved in the broad jump test and 51% in the bicycle time-to-exhaustion test. If you're not familiar with Athletes' Performance, it's a go-to facility for elite professional athletes from the NBA, NFL, MLB, Olympians etc. Using hydration bottles from Thermos with vacuum insulation technology, the results of the study showed that drinking cold water (40° F) significantly mediates and delays the increase in core body temperature during exercise. If I understand the abstract correctly, as we work out, and the body temperature rises, we are more likely to get dehydrated, which affects performance. Drinking cold water delays that rise in body temperature. Hence, performance is not hampered by heat-related stress that leads to fatigue and other negative effects. To keep water at the recommended 40°F during workouts, start with cold water from the refrigerator (or tap water with ice) and keep it cold in a hydration bottle with Thermos brand vacuum insulation technology, which will keep drinks cold for up to 12 hours. It's unusual to me that trade and professional associations would make product recommendations, but such it is in a world where media, content and marketing have all become important in the social eco-system. ACE, the American Council on Exercise sent out the following holiday gift ideas for people who love fitness. I respect ACE a lot, and if they say these are good fitness products, it's worth passing along the info. As they say, Cyber Monday will be here before you know it. · Calorie counter: The next generation of the standard pedometer, a fitness tracker like the BodyMedia® FIT can help keep track of how many calories are burned throughout the day, how many steps taken, and the duration of sleep every night. The package consists of the BodyMedia FIT Armband, designed to be worn up to 23 hours a day to provide an accurate assessment of calories burned, and the online Activity Manager, which stores all of the fitness data gathered and allows the user to set unique goals, monitor progress and more. It’s even Bluetooth enabled to allow the user to view his or her fitness data on a smartphone on the free mobile app. · Heart rate monitor: Using a heart rate monitor is an excellent way to measure and track the intensity of a workout by seeing where you are in relation to your target heart rate zone. Polar produces a variety of monitors that can meet the needs of almost any exercise enthusiast, and they are one of the most recognized names in the industry. Whether you just want to monitor your heart rate, or you also want to keep track of calories burned and other vitals, there’s a monitor on the market to meet your needs. · Interval timers: High intensity interval training (HIIT) is an effective way to exercise that consists of bouts of high intensity exercise followed by short rest intervals. Using an interval timer can help easily and effectively maximize your HIIT workouts by keeping track of how many seconds you need to spend on each interval and rest in between. A good option is the GYMBOSS® Interval Timer and Stop Watch, which can easily be clipped onto an armband, waistband or belt. The timer allows you to set the number of rounds, length of time, and whether you want it to vibrate or beep to alert you to move onto the next round. · Fitness apps: No matter what smartphone your intended recipient has, purchase a gift card that will allow him or her to download a few of the many excellent workout apps available on the market. Fitness apps can help you track your caloric intake and workouts, remind you to exercise, or even provide you with workout programs to follow while on the go. The Bootcamp® Challenge App, created by ACE-certified Group Fitness Instructor Lori Patterson, features three 18 day programs for beginners, intermediate and advanced workout fans that can be customized according to the equipment you have on hand. Did you catch the article over on Examiner.com about the World Pole Dancing Championships? There are great photos there, so if you didn't see the article go on over. And while you're there, if you are in the Bay Area, click on the link to Twirly Girls - a pole dancing studio here in Silicon Valley. I really must get up there to interview them at length one day. I've had email exchanges with them on several occasions and the ladies there are super. At FitExpo, I met Twirly Girls founder, Bel Jeremiah. She's wonderful. Incredibly fit and in a charming way that makes you feel great about yourself. I liked her immediately and from what I've seen among her students, she has a way of a creating community of caring people. Over the holidays, showers, book clubs and girls night out take on special festivity. If you're hunting for some low calorie ideas for cocktails, take a look at these from Voli Light Vodka. If you're looking for light, low calorie ways to entertain over the holidays, the dilemma of what to serve for drinks come to mind. The folks at Voli Light Vodkas, which has about 1/3 fewer calories than other vodkas, sent along these recipes for cocktails that fit the bill and are elegant to boost! Sure, you can sit at home and shop online over the holidays, but for many of us, it's all about the fun of mixing it up with the crowds and finding on-the-spot specials in the malls. With that in mind, the team from online training portal FitOrbit.com put together fitness tips from trainer Ilyse Baker for your shopping adventure. These workouts can be logged in to your FitOrbit app on your Smartphone straight from the store to keep you on track – even at 4 a.m.
Waiting-in-Line Calf Workout: Calf raises are discreet enough to try while you’re waiting in line, but effective enough to give you a mini-workout. All you need to do is stand straight with your feet about hip width apart and rise on the balls of your feet, lifting your heels off the floor. Shopping Squats: While you’re standing outside the dressing room, waiting in the never-ending line for the register or staking out the perfect parking spot, bend your knees slightly to complete a squat and target curves. Embrace the crowds: Although Black Friday means a crowded mall or store, park the car further away and walk whenever you can. Although you don’t realize it, walking from store to store can be a great workout. If you’re feeling exceptionally excited about Black Friday shopping, try jogging from your car to the mall for a burst of pre-shopping energy. Shopping Bag Arm Workout: As your arms become filled with purchases, even out the weight in each hand and lift the bags up and down when waiting in line or deciding between purchases. If you're not familiar with FitOrbit here's what their team sent: For less than $2 a day, FitOrbit delivers personal trainers and individual fitness and nutrition programs online. All members get a full lifestyle package, including a smartly personalized workout regimen, a realistic meal plan, plus 24/7 standby support. Members get to choose a real, certified trainer whose personality and approach mesh with theirs. Pledge to Joining Forces: The collaboration between ACE and Joining Forces continues to raise 1 million fitness training service hours, and any donation is welcome. Whether it’s an hour of personal training, a small group training package, or access to group fitness classes, all of the time will help service members and their families lead a healthy lifestyle. For more information on how to donate, visit www.acefitness.org/joiningforces. Enroll in continuing education: ContiningEd classes are available to provide guidance on working with service members who have just returned home, and may be recovering from an injury. For example, the Healthy Minds/Healthy Bodies curriculum provided through ACE focuses on training veterans who have spinal cord injuries, brain injuries, and/or post traumatic stress disorder, among other ailments. Share the opportunity: Personal training is one of the fastest growing careers in the U.S., and a prime opportunity for service individuals returning from duty and military spouses looking for career options. Many organizations offer financial assistance and military discounts for those interested in pursuing a personal training or group fitness instructor certification. For more information on ConEd courses and certifications, visit www.acefitness.org.